Save the date for your premier networking and learning opportunity within New York State! 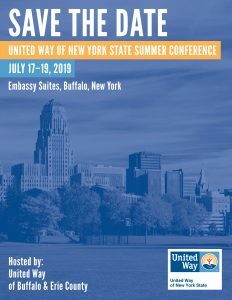 July 17-19, 2019 at Embassy Suites Downtown Buffalo, NY! Near the free shuttle to the waterfront! Including cook to order breakfast and free valet parking! There will be workshops on resource development, community impact and initiatives, governance, the Census 2020, digital fund raising and marketing, strong advocacy, cyber crime trends and protection, updates coming for ALICE 2020, 211 Innovations and MORE! If you have a cool topic, idea or are willing to present- please fill out the attached form and return by April 12th! We work hard to serve you…. And we’re keeping the price low! That includes hot breakfast and FREE valet parking! You can’t afford NOT to come and bring your staff! Registration Opens Soon. Stay tuned for that email! If you know of a company that might like statewide reach- the sponsorship form is attached. Please help me reach our goal! This is a for-profit company’s chance to get in front of hundreds of local United Ways… and right now, it’s their only chance through our office….. don’t let your friends and allies miss out on this great opportunity! FAMILY WIZE is BACK! They are our longest running sponsor and first confirmed for 2019. Kudos. We look forward to seeing you in Buffalo on July 17-19th!